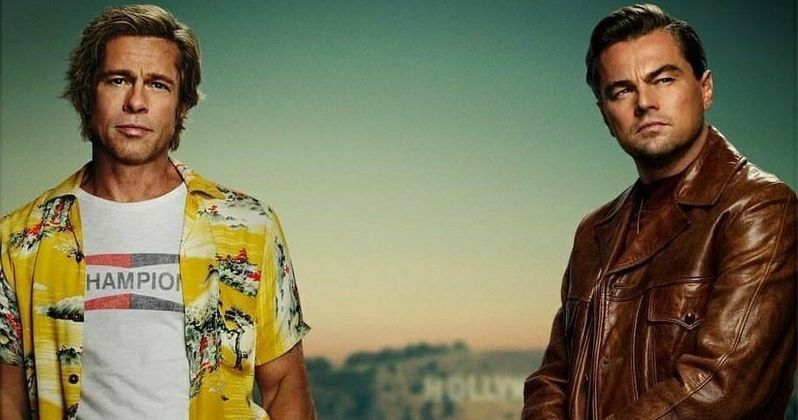 Once Upon a Time in Hollywood, The ninth film by Pulp Fiction and Inglourious Basterds writer-director Quentin Tarantino will be upon us this July starring Leonardo DiCaprio and Brad Pitt (to name a slight few). The trailer is all set to hit these here internets sometime this coming week and to prepare all of us for what is sure to be a killer two and a half minutes, today we have the film's poster to share with you guys. The poster, which you can check out below, features Leonardo DiCaprio and Brad Pitt looking full Starsky and Hutch standing in front of the Hollywood sign in the late 60's looking just like the definition of cool. Seriously, look in the nearest dictionary, and I'm sure the definition changed this morning to show this poster. The film has just about the most killer cast of our time with DiCaprio and Pitt leading the charge. The rest of the cast includes such Hollywood heavy-hitters as Margot Robbie as Sharon Tate and Al Pacino as Marvin Shwarz. The late Luke Perry will join them as Wayne Maunder, along with Emile Hirsch as Jay Sebring, Damian Lewis as Steve McQueen, Bruce Dern as George Spahn, Dakota Fanning as Lynette "Squeaky" Fromme, and Scoot McNairy as Business Bob Gilbert. Damon Herriman also stars as Charles Manson, Austin Butler as Charles "Tex" Watson, Lena Dunham as Catherine Share, Maya Hawke as Flower Child, Clifton Collins Jr. as Ernesto "The Mexican" Vaquero, and Nicholas Hammond as Sam Wanamaker. But that's not all, Spencer Garrett will star as Allen Kincade, Mike Moh as Bruce Lee, Keith Jefferson as Land Pirate Keith, Eddie Perez as Land Pirate Eddie, Maurice Compte as Land Pirate Mao, Lew Temple as Land Pirate Lew, Lorenza Izzo as Francesca Cappuci, and Rafał Zawierucha as Roman Polanski. On top of all those fine thespians, the movie will also feature Samantha Robinson as Abigail Folger, Rumer Willis as Joanna Pettet, Dreama Walker as Connie Stevens, Costa Ronin as Wojciech Frykowski, Margaret Qualley as Kitty Kat, Victoria Pedretti as Lulu, Madisen Beaty as Katie, and Zoë Bell as a stunt coordinator's wife. Additionally, Tim Roth, Michael Madsen, Kurt Russell, Timothy Olyphant, James Marsden, Michael Vincent McHugh, Julia Butters, James Remar, Martin Kove, Brenda Vaccaro, Nichole Galicia, Craig Stark, Marco Rodríguez, Ramón Franco, Raul Cardona, Danny Strong, Sydney Sweeney, Clu Gulager, Mikey Madison, Inbal Arimav, Natalie Cohen, Rachel Redleaf, Kansas Bowling, Parker Love Bowling, Daniella Pick, and Rebecca Rittenhouse have all been cast in unspecified roles. DiCaprio will star as Rick Dalton, an actor who starred in a hit Western television series back in the early sixties but has fallen on hard times since. Evidently, his attempt to transition to movies has not worked out, and in 1969, he is struggling, doing guest roles on other people's programs while contemplating moving to Italy. Ominously, however, he is a neighbor of the doomed Sharon Tate. Brad Pitt meanwhile plays Cliff Booth, Rick's longtime stunt double and best friend. Once Upon a Time in Hollywood is written and directed by Quentin Tarantino who also produces the new movie alongside David Heyman (the Harry Potter film series and Shannon McIntosh. Columbia Pictures, Heyday Films, and Bona Film Group produced the flick, and Sony Pictures Releasing will be unleashing the flick upon the masses on July 26, 2019. The poster was shared by Leonardo DiCaprio's Instagram.